Think about the call of the Apostles- Jesus didn't call Peter or Matthew or Philip in the same ways. He certainly didn't use the same methods when he invited Paul, Mary Magdalene, or Martha to follow Him. He encountered people while at work, in their homes, on the streets, on hilltops, and from the cross. Jesus treated each person He met as an individual and continues to do so- why shouldn't we do the same as educators? I think that looking at education through the lens of the Multiple Intelligences helps us to see how saints like St. Mother Teresa and St. Therese of Lisieux, who had such different strengths, could both love and serve the Lord so well. Created by Howard Gardiner, the Multiple Intelligence Theory equips teachers to see various abilities, strengths, and talents combining to create smart kiddos, not dependent on a particular test scores or grades, changing our thoughts to not "if" a child is smart, but "how" he or she is smart. This educational theory has helped me to differentiate in my classroom, reaching all students and seeing them as unique, unrepeatable, and irreplaceable individuals. For more info, check out this pinterest board for links to research, smarts quizzes, and graphics about the Multiple Intelligences. 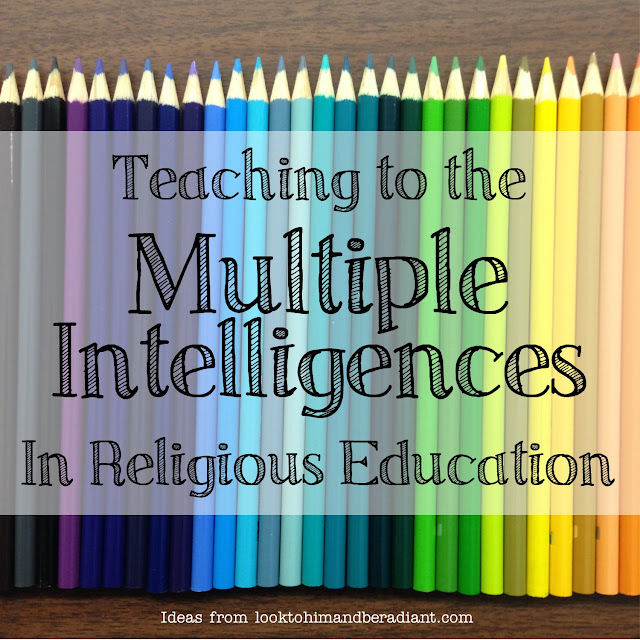 I think that all teachers, parents, and catechists can benefit from taking a look at the Multiple Intelligences in their homes and classrooms. Over the next couple of months, I am going to offer a series on applying this educational theory specifically in Catholic classrooms, looking how we can present faith filled content in ways that reach all kids. Today I'm using the Rosary as an example, but will also post ideas for teaching about the Mass, connecting kids with Saints, and helping them pray. 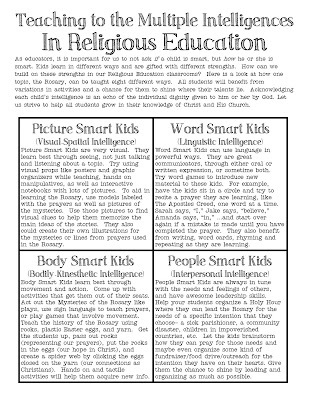 Each post will include a printable handout with the ideas organized by "smarts" that could be shared with coworkers, given to catechists or parents, or even used as an activity choice board for older students. Students thrive with variations in activities and a chance for them to shine where their talents lie. Acknowledging each child’s intelligence is an echo of the individual dignity given to him or her by God. Let us strive to help all students grow in their knowledge of Christ and His Church. Picture Smart Kids are very visual. They learn best through seeing, not just talking and listening about a topic. Try using visual props like posters and graphic organizers while teaching, hands on manipulatives, as well as interactive notebooks with lots of pictures. To aid in learning the Rosary, use models labeled with the prayers as well as pictures of the mysteries. Use those pictures to find visual clues to help them memorize the main ideas of the stories. They also could create their own illustrations for the mysteries or lines from prayers used in the Rosary. Word Smart Kids can use language in powerful ways. They are great communicators, through either oral or written expression, or sometime both. Try word games to introduce new material to these kids. For example, have the kids sit in a circle and try to recite a prayer they are learning, like The Apostles Creed, one word at a time. Sarah says, “I,” Jake says, “believe,” Amanda says, “in,” …and start over again if a mistake is made until you have completed the prayer. They also benefit from writing, word cards, rhyming and repeating as they are learning. Body Smart Kids learn best through movement and action. Come up with activities that get them out of their seats. Act out the Mysteries of the Rosary like plays, use sign language to teach prayers, or play games that involve movement. Teach the history of the Rosary using rocks, plastic Easter eggs, and yarn. Get the students up, pass out rocks (representing our prayers), put the rocks in the eggs (our hope in Christ), and create a spider web by clicking the eggs closed on the yarn (our connections as Christians). Hands on and tactile activities will help them acquire new info. People Smart Kids are always in tune with the needs and feelings of others, and have awesome leadership skills. Help your students organize a Holy Hour where they can lead the Rosary for the needs of a specific intention that they choose– a sick parishioner, a community disaster, children in impoverished countries, etc. Let the kids brainstorm how they can pray for those needs and maybe even organize some kind of fundraiser/food drive/outreach for the intention they have on their hearts. Give them the chance to shine by leading and organizing as much as possible. Self Smart Kids are very in touch with self knowledge and emotions. They will be able to remember and apply new information when they have a chance to create connections to themselves. When teaching the Rosary, encourage these kids to picture themselves being present during the different mysteries. What did they see? What were they thinking? What did they feel? Have them journal, draw, or discuss their visualizations about those meditations. They will appreciate quiet time in a church, Adoration chapel, or prayer space at home. Music Smart Kids love anything with a tune or a beat, so use this to your advantage when teaching new material. Find CDs or YouTube videos with the prayers of the Rosary or meditations set to music. Come up with rhymes or statements said to a beat to help them memorize new prayers. This works especially well with tunes that they are already familiar with– use those secular songs and make them holy! Invite them to sing or play an instrument at a Rosary prayer service or just in the classroom with fellow students. Nature Smart Kids love the world around them. Get those kids outside as much as possible. Go on Rosary walks so that you can pray for the community around your church. Have those students help you plan a Mary Garden as a place of beauty and prayer. They will love seeing and growing all kinds of plants and flowers named in honor of Mary, whether you create a shrine, prayer labyrinth, or outdoor Stations of the Cross. They also could collect flowers and greenery to make arrangements for the church interior for a Mass or prayer service. Number Smart Kids are all about numbers. They are good with math and tend to think in a very logical and organized fashion. Let them be the “math whiz” and figure out how many years it has been since St. Dominic was given the Rosary, how many Hail Marys are said in a complete Rosary, etc. Plan a make-your-own Rosary activity and let them organize how many beads, the length of cord, etc. your class would need for each student. They even can help figure out the budget for the project and cost compare different supplies. Read more about the Life and Dignity of the Human Person from the USCCB here. “There are different kids of spiritual gifts but the same Spirit; there are different forms of service but the same Lord; there are different workings but the same God who produces all of them in everyone. "It will as when a man who was going on a journey called in his servants and entrusted his possessions to them. To one he gave five talents; to another, two; to a third, one- to each according to his ability." "As each one has received a gift, use it to serve one another as good stewards of God's varied grace." Very interesting. We are all gifted, just differently. Yes! There are some quizzes that you can take to see the range of strengths. You'd need to preview them to see if they would work for your age and abilities of students, but I think that they would be a useful tool for you, and a source of self-knowledge for them. I collected some quizzes on the Pinterest board that is linked above. Feel free to check those, or search Pinterest for something else that might be a good fit! My goodness, The Spirit has definitely worked through you in such a powerful way. This series has my heart. It reminds me of the Apostles, how each served Christ according the their ability. I thank you so much for this. It is so necessary and probably the BEST resource I have ever found. I pray God blesses you abundantly and continues to use you for His Glory. Emely, thank you! Yes, I too was so reminded of the Apostles and especially Christ's individual call and role for them. How great that we get to help share that mission! People for the duration of their life used to take after simply the people who have the money or some kind of hoisted desire for living with them and after that, they use to endeavor for as far back as they can recollect as to achieve and this http://www.phdexpert.net/sociology-phd-thesis/ site to keep up unclear life from the life of their ideal.